During our two days in Yangon, Myanmar there was one site that we could not miss. The Shwedagon Pagoda is one of the greatest temples and religious shrines in the world. It is the most sacred Buddhist Pagoda in Myanmar and known as "The Crown of Burma." 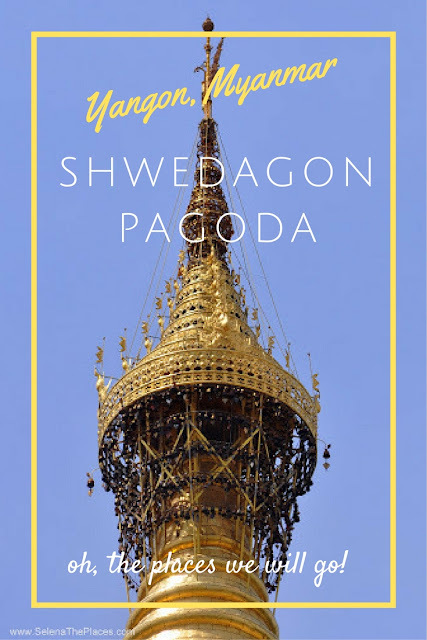 The pagoda is perched on a hill in Yangon, a beacon to both the devout and the curious. The golden spire reaches 375 feet (99 meters) and can be seen from most every spot in the city. It is a sight to behold from both afar and close up. I still can't believe we were able to visit such a wonder. There are four entrances, north, south, east and west with steps leading up to the raised platform that houses the pagoda. We entered from the south entrance which is guarded by two massive chinthes, mythological lion-like creatures. The main platform covers 14 acres and is inlaid with marble tiles. The platform also contains hundreds of other structures, temples, stupas, statues, prayer halls and shrines. Legend says that this has been a sacred site for 2,500 years and contains holy relics from four previous Buddhas, a staff, a water filter, a piece of robe and 8 strands of hair. Archeologist believe that it may have been first built around the 6th century. The temple has been repeatedly damaged by earthquakes, each time rebuilt to be taller and grander. By the 16th century, it had become an important pilgrimage site and is one of the most sacred temples in Buddhism. We paid the small entrance fee charged to foreign tourists and put our shoes in our bags. Shoes and socks are not allowed to be worn and visitors are expected to dress modestly and act appropriately. We were quickly approached by an English speaking guide offering to lead us around the site for a small fee. As we wanted to get some context, we agreed to her price and set off. It didn't take long to realize that our guide didn't actually speak English but had memorized some specific content in English. We walked around the pagoda in a clockwise direction as is proper. But we had to run to keep up with her, trying to stay in the shade or on the plastic walkways. Marble is hot in the glaring heat of a Burmese day, giving true definition to the expression "hotfooting it". 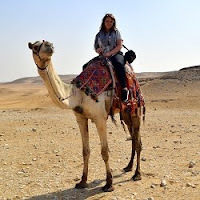 Our guide fed us details by rote as she scurried around the site and any questions were met with a blank stare. She was friendly and well-intentioned, but we were happy when she moved on to her next tour. We went around again at a slower pace taking it all in. I would recommend hiring a guide, just be a bit more careful then we were. The obvious centerpiece is the Golden Pagoda. The solid structure sits upon a octagonal base with terraces that can only be accessed by monks and males. Above that is a bell-shaped stupa topped with an inverted alms bowl. Then there are seven circular bands topped with a turban of lotus petals and then a banana bud. At the top is a bell-shaped umbrella crown. The entire structure is covered in gold plates and gold leaf. The people of Myanmar including royalty have been donating gold for centuries. The glare of the sun makes it difficult to look at it directly. From the platform you can't really see the details of the hti, or spire decoration that rests atop the stupa, but there is a photo gallery extolling all of the extraordinary details. Weighing over a ton, the seven-tiered umbrella crown is made of gold-plated iron. It is covered in bells and jewelry, thousands of precious stones, rubies and sapphires, and over 1,000 diamonds. At the golden tip, a diamond orb covered in 4,000 more diamonds cradles a magnificent 76 carat diamond. A sparkling, tinkling, golden, bejeweled lightning rod. Truly incredible. The octagonal base is surrounded by 64 smaller stupas and at each of the eight corners is a shrine dedicated to a day of the week. In the Buddhist calendar, Wednesday is split into two days, before and after noon. According to Eastern astrology, each day has a planet and animal dedicated to it. Here people born on that day will make offerings and burn candles. Thanks to Google I was prepared. I headed to the Friday corner to pour water onto the Buddha statue, to leave a wish and a prayer. In my previous post on Myanmar, I wrote about the difficult recent history of Myanmar. This sacred site has been the epicenter of much of that history. Earthquakes and fire haven't been the only forces to challenge its existence. It's been looted and pillaged throughout history and was occupied twice by British forces for almost 80 years. With strikes, demonstrations and protests by students and monks, the gilded temple has been the focal point of the recent revolution. Restored to its former glory and again open, thousands travel here each day for worship and meditation, to leave gifts and offerings. I never found the exact number but there are hundreds of Buddhist images located throughout the pagoda. Some of them surrounded by LED lights in flashing neon colors. There is a Bodhi tree on the grounds said to be grown from a clipping of the original tree in India where Buddha reached enlightenment. The Shwedagon Pagoda is a fascinating place to visit and is as unique in the world as the city itself. I did research on Myanmar before we went, but it wasn't until I returned from our visit that I real dug into the details. If you love history as I do, then you should dive into the incredible story of Myanmar. "Then, a golden mystery upheaved itself on the horizon. . .
a shape that was neither Muslim dome nor Hindu temple spire. . .
the golden dome said: This is Burma, and it will be quite unlike any land you know about."